Intramural sports offer competitive and fun individual, dual and team sports. 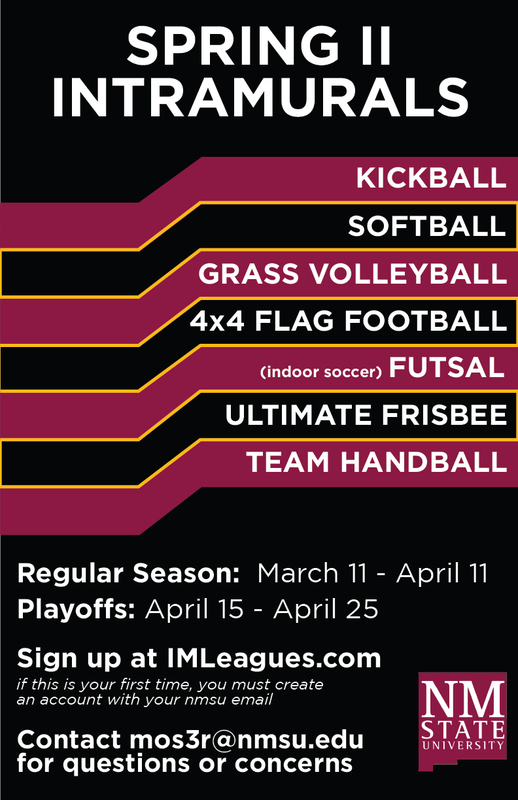 Teams compete against each other within the NMSU community.Intramural sports offer competitive and fun individual, dual and team sports, such as flag football, table tennis, badminton, kickball, volleyball, ultimate frisbee, soccer, disc golf, racquetball, grass volleyball, dodgeball, softball and golf. Teams compete against each other within the NMSU community. Divisions include men’s, women’s, co-recreational and open. The Spring 2018 Intramural Sports Schedule is now available. Attention: You must sign up for Intramural Sports online. Click the link(s) below to create an account and to sign up a team.